A day's growers meet was organized by Rijk Zwaan India seeds Pvt Bengaluru in association with Sumukha farm feeds Hosur (Distributor for Rijk Zwaan Seeds) on Protected cultivation on 30th April 2013 at Hosur. 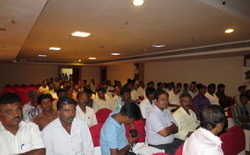 There were about 150+ growers from three South Indian states, such as Karnataka,Tamilnadu and Andrapradesh. In addition we were privileged to have Scientists from Indian Institute of Horticultural Research, Horticulturists, Exporters, Agri consultants and Traders to be part of this event..The response to the protected cultivation was overwhelming.